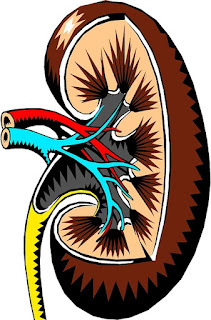 Nephrotic syndrome means that there are couple of symptoms that can reduce the efficiency of the Kidney. There are many website out there that explains the causes, symptoms, diagnosis, prognosis and treatment for Nephrotic Syndrome. In this post, I will share a case study how nephrotic syndrome was identified at early stage and how it got reduced using Ayurvedic treatment in India. This case study is written after consulting with 2 Nephrologists- Lourdes Hospital, Aster Medicity, 1 Urologists - Rajagiri Hospital, 1 Homeopathic and an Ayurveda doctor. Nephrotic Syndrome or the Minimal Change Disease or IgA Nephropathy or Focal segmental glomerulosclerosis [FSGS] are often seen in Children. It can be present in Adults without any particular cause. If you have any such disease or symptoms, the first thing is to do tests and get a diagnosis. Then start reading about the disease and get as much awareness as possible. Hematuria - Presence of blood in Urine. This is microscopic. A test is needed to identify this. Edema - Puffy Face and swelling usually in the legs, feet, or ankles are quite common in this disease. Decreased urine output, although occasionally urine output remains normal. You must do all these tests even if your doctor does not ask to do them. This is to ensure nothing else is causing this like Kidney Stone Although kidney stone is not proved to have any relation with albuminaria. I had all of these and find out the ESR is 96 and had high Albumin. The current medicines in English medicines are Diuretic, ACEI, ARBs, steroids and tablets to reduce blood pressure and the new invention is the infusions of Rituxan/Rituximab. You should know that there is no cure for nephrotic syndrome in English Medicine. They will try to manage the symptoms and will not go to the cause of the problem. If your disease gets worse, you can always go back to English Medicine. I had high Albuminaria - 3807 mg/24 hour urine. That's quite a lot. I was Tired and Sleepy all the time. I Had severe cough and throat infection for quite long. The nephrologist prescribed for losartan to reduce the pressure and another nephrologist informed me that I may have to undergo renal biospsy. I went to a famous Ayurvedic doctor and showed him all test results. He suggested 3 medicines - Kanmada Bhasmam, ArthaVilwadi and Drakhshadi. I have been taking them since 7 months now with periodical check up and urine tests. 21 February 2019 result - Albumin has reduced to 1800.9 mg/24 hr urine. 15 March 2019 result - Albumin reduced to 1113 mg.
On top that, I reduced taking Tea, quit my job and take rest now at home, drink one glass of water with little tumeric powder in it etc. You should try to not to get sick or get affected with any disease. Stop smoking, stop drinking and drink enough water. Do keep your options open. Try Ayurveda for 4 months and check the result periodically. That's all I can say. Facebook Support Groups such as Nephrotic Syndrome, Nephrotic Syndrome Parent Support, can help you to discuss the issues and get advice and awareness. NephCure Kidney International runs a Facebook page to give awareness to people on this. I was inspired to write this post after seeing the Matthew and Nephrotic Syndrome page. Matthew was diagnosed with Nephrotic Syndrome in 2012 and he had a hard journey. He writes all the tests, problems he had to undergo. He had Rituximab and have been In Remission for around 8 months. Nephrotic syndrome/Minimal Change Disease is another page where a mom writes about her child who has this syndrome. Check out NephCure.org or email directly at khelm[at]nephcure.org and he will send you some resources. Depending on the biopsy results there may be an alternative to prednisone. If you have FSGS be sure to look into http://www.firstx-trial.com this is an alternative first line treatment to steroids. It has been showing promise! You can find more info about treatment sites close to you at www.kidneyhealthgateway.com I know I just threw a lot your way, so please feel free to reach out. 1. Townsend Letter for Doctors & Patients, is a periodical focusing on alternative medicine which has been in circulation since 1983. Do share for others who may have been experiencing the symptoms or have the disease.